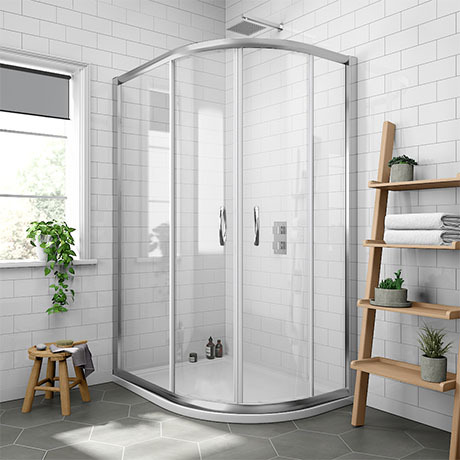 The minimalist Newark right handed offset quadrant easy fit shower enclosure with pearlstone tray features 5mm toughened glass sliding doors for easy access, with 40mm adjustment for easy fitting and a beautiful satin chrome finished frame. Item does what it does. Thank you. Not yet installed but looks fantastic. Very good quality and well priced. Overall an excellent deal. Very easy to fit good quality. Nice practical size and drains away fine. Unfortunately the fitting instructions were rubbish even my fully qualified Plumber couldn't understand them. The very small photo's were illegible and he had to spend an extra hour or so of trial & error to assemble which has meant extra cost to me. I checked them myself so take care!